Anyone with a dog knows that their four-legged companion is more than just a pet - he or she is a part of the family. How could you possibly leave Fido back at home with a dog sitter or in a boarding kennel while you are on vacation? 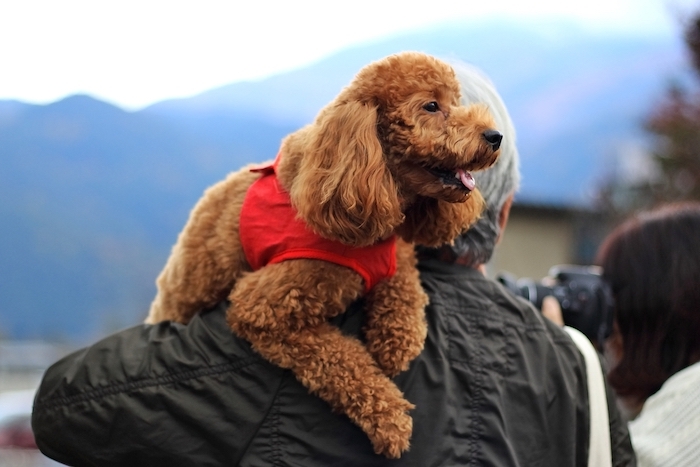 It can be difficult to part with your dog, especially when you choose a getaway destination that offers a wide range of activities that you know you would enjoy doing with your furry buddy. This is definitely true of Helen, Georgia, and the good news is that there isn't any reason why your dog can't come along to join in with making lasting memories with you and your family. Pet-friendly cabins make it possible for all of your loved ones to be with you on your next vacation. While visiting Helen, Georgia, you and your dog should be able to live in the lap of luxury. Lush cabins, like those available from Cedar Creek Cabin Rentals, make it possible for pet owners to be able to stay someplace nice - even when the family dog is along for the trip. You'll have your pick from 23 different cabins - all of which have something exquisite to offer and are welcoming of your furry pal. 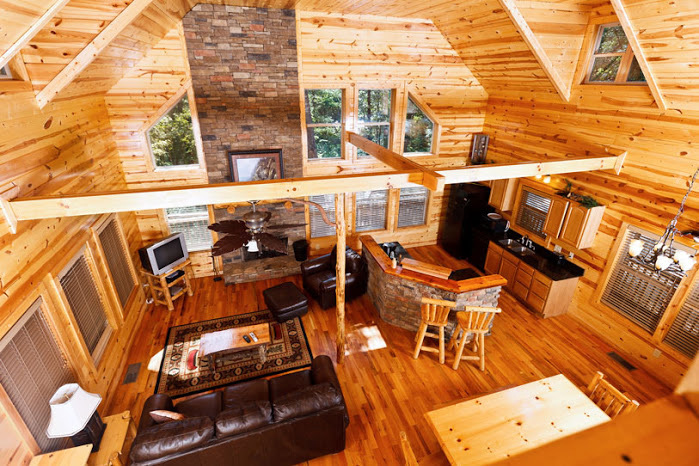 Whether you're traveling with a large family that requires multiple bedrooms, or are on a getaway with that special someone, you'll find the pet friendly cabin that you need to completely enjoy your experience in northern Georgia. One of the best ways to experience northern Georgia with your pooch is by taking a hike. Even just wandering in the wooded areas around your cabin will give your dog some fresh, exciting new scents, and opportunities to splash in a nearby creek. Of course, there are also a huge variety of scenic hiking trails that are dog-friendly. Be sure to allow your furry friend to tag along on hikes at Unicoi State Park, Smithgall Woods, Amicalola Falls State Park, and many others. For the safety of your pet, be sure to follow park rules and leash laws at all times. Many of the state parks in the Helen area, as well as other surrounding locales, are trendy spots for geo-caching. By logging onto a geo-caching website, you can receive clues or coordinates that indicate where a capsule has been hidden. You will need to follow your GPS signal on a hike that will lead you to the capsule, where, inside, you will find a small token or treasure that the hider has left for you. It is your job to replace the token with something of your own, re-hide the capsule, and post the new coordinates online. In many cases, you will find that other animal lovers have created doggy caches with special treats and prizes for the pooches. If you're feeling up to a round of putt-putt with family or friends, you won't have to leave your dog behind. The spectacular Alpine Mini Golf Course is pet-friendly. 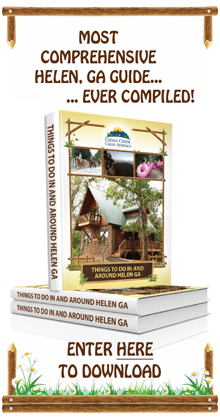 Do you want to make Rover's vacation to Helen, Georgia really special? You'll want to make it a point to stop by Moon Doggies in nearby Sautee. This unique pet specialty shop offers a wide variety of cool items for man's best friend to enjoy. You'll find fashionable collars and leashes (including a great selection of glow-in-the-dark items), LED leads and collars, handcrafted doggy beds, raised food bowls, pet hammocks, placemats and strollers for the dog, comfortable crates, floor mats, and more! While you're at it, why not give your four-legged pal an extra treat? Moon Doggies is known for its specialized doggy treats. Your dog will go crazy for "Bowser Beer" which can be poured over dry kibble or straight out of the bottle. This "brew" comes in both chicken and beef flavors. Another popular treat is "Puppy Crack" which consists of delicious wafer-esque dog crackers in chicken or beef flavors. These are made with real chicken liver and beef. Don't forget to stop by Moon Doggies Bakery before you go. Your dog will go gaga over a good range of healthy baked dog treats. Finally, MoonDoggies offers hourly pet sitting services. If you're hoping to visit an attraction that isn't pet-friendly, but don't want to leave your dog alone at the cabin, call MoonDoogies. You can rest assured that your pet will be well cared for and given the love and attention they need while you're gone. We'd love to Hear Your Comments Below on This Blog Post or About Your Big Adventure In Helen with Your Pet !